The Hoozin Digital Workplace is a technology that creates a virtual equivalent of the physical workplace. This will force organizations to rethink all of their digital processes. The Hoozin Digital Workplace enables new, more effective ways of working; raises employee engagement and agility; and exploits consumer-oriented styles of working. Especially on the last topic, ‘consumer-oriented styles’ Hoozin is determined to become a disruptive player on the Digital Transformation market. At Hoozin we take the concept of the Digital Workplace much further than the mainstream voices out there. 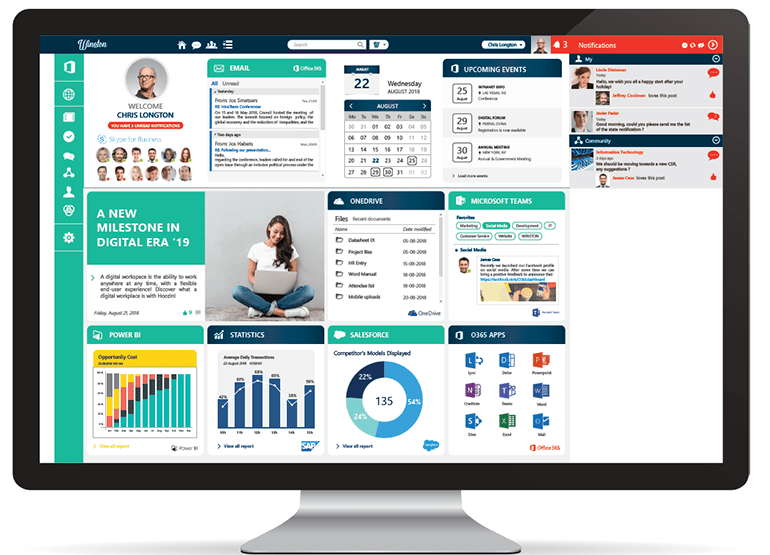 The Hoozin Digital Workplace is the smartest, most impactful and easiest way to achieve integration between applications on one side, and user adoption and engagement of your business users on the other side. We help customers worldwide in innovating their employee workplace, entirely based on new thinking. We know how to mix collaboration through Hoozin (out-of-the-box) while integrating your existing applications into the end user experience. All this contributes to more productivity and happier employees. The Hoozin mantra is ‘let’s move from an Intranet culture to a Digital Workplace culture’. Hoozin proposes a very refined process to define your Digital Workplace and how to evolve it over 6, 12 and 18 months. The construction of the Digital Workplace is an agile process involving Business stakeholders and IT. By blueprinting your collaboration and integration strategy, we can quickly find common ground between the Business, Compliance, IT and other stakeholders. The major concerns for many organizations are the architecture, the design, the integration, security, and compliance. Hoozin has a very refined processes to not only achieve major productivity goals for your business users but also reduce IT complexity. Our customers and their CIOs have become relentless cost cutters while improving the reputation of IT. For Hoozin, consolidating applications and processes is not a sport; it’s a TCO mission with tangible results. Processes are out there. One of the missions of many organizations is to make sure processes are respected and followed. Hoozin also sets goals to introduce more dynamics in the workplace, more creative space for employees and push for more non routine work. If we divide employee interests and organizational interest we can come up with a short list of potential goals. The future state of the Hoozin Digital Workplace and how it will benefit all stakeholders should clearly be designed and validated. It should be consistent with the organization’s values and serve as a source of inspiration to the stakeholders who will drive and implement the Hoozin Digital Workplace. Application programming interfaces (APIs) are the key enabler for the Hoozin Digital Workplace – they are the glue that ties information and users together. APIs are an integral part of an entirely new way of approaching organizational problems and technology solutions. 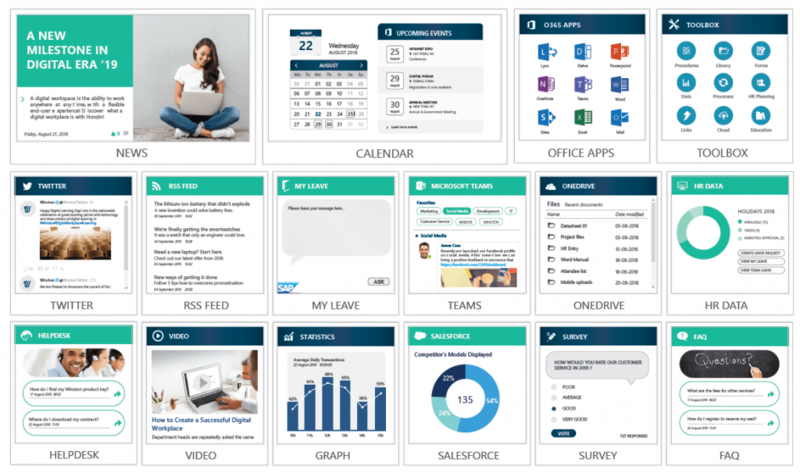 Since the world of API’s is like the wild west, Hoozin had to come up with a more standardized approach to connect the organizational applications into one high design landing page of the Hoozin Digital Workplace. The Hoozin Widget builder is the perfect technology set to quickly integrate any application you may have out there. 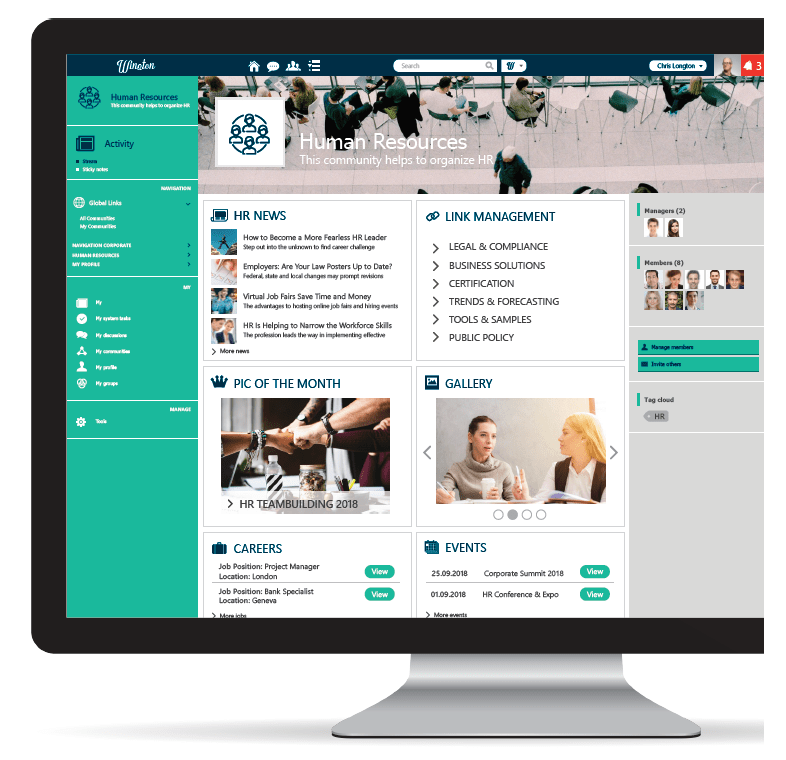 The Widget Builder allows fast development and deployment of the Hoozin Digital Workplace. It covers all key areas such as design, size, content, API calling and security. Every Hoozin integrated widget has a predefined setup. The code development is exceptionally fast, practical and the code is open for change. To code faster, one has to be efficient; that is, no wasted effort or time spent on new learning curves. This can mean anything from typing to tooling, to thinking. But most of our efforts in speeding up the coding isn’t typing, or compiling—it’s maintaining it in fix pre-defined code ‘buckets’ that represent Hoozin Widgets. To think faster, you have to avoid reinventing the wheel and the basics. This is the knowledge and wisdom that sits deeply rooted in the Hoozin Widget Builder. Customers, Partners and Hoozin itself can work on new ‘out-of-the-box’ widgets to build fast and easy integrated landing pages. The Hoozin Widget Builder is, therefore, the number one accelerator of your Digital Workplace strategy. At Hoozin we look at the Digital Workplace as something much deeper than connecting existing applications to the workforce. The ultimate goal is to target content and applications to the right target group in your employee environment. ‘Advertising’ applications and new business processes on the landing pages and making them appear based on profile or job title is the new way of deploying applications. Workers expect enterprise tools for searching, sharing and consuming information to be as « smart » and compelling as those they use in their personal lives. They want information and analytics to be contextualized, based on their work and delivered when they need it. We need to accept that deploying applications is a technical process, as well as a communication process. Help Business users find new applications, get them to see it where they go and support the adoption. There are applications in every possible department, in every possible format, presented in every possible way. All of which are battling for your employee’s attention. Rather than wring our hands about the influx of data, we need to get smart about a concept that’s become necessary for success: Amplification. Amplification is just another way of saying “finding the best new way to get the required Application within eyeball range of my digital worker.” These new ways don’t always involve change management, but they usually do. While the classic employee engagement strategies are mostly intangible and perceived as no costs (not counting time and resources), they’re also massively time-consuming and rely heavily on luck. How do we promote applications and new business processes to employees? How do we target this? Hoozin mostly uses data from the user profile amongst other data sets. Hoozin allows building high design target pages. These pages have a critical Business topic such as Humans Resources or IT. These ‘mini intranet’ pages can also be populated with integrated Widgets, directly coming out of the Widget Builder factory.